D&S Support™ is a unique combination of minerals, fibers, and super foods designed to be taken 30 minutes before meals. It works safely because it uses natural ingredients. Chromium polynicotinate is an essential trace mineral. Apple pectin and gar gum are soluble fiber that promotes a feeling of fullness. Bee Pollen is actually the only food containing all the essential nutrients needed by the body but cannot be manufactured. Fenugreek seeds are used as a spice and contains a soluble fiber known as mucilage. Flax Seed Powder (and flax seed meal), otherwise known as ground flax seed is a nutritious addition, a food with a high energy density. Vanadium supports certain enzymes to accelerate chemical reactions for better metabolism. Spirulina is a single-cell, microscopic blue-green algae that is considered a super food. Don’t gamble with your health! Many hyped weight loss products only appear to succeed by increasing your blood pressure, forcing the body to lose necessary fluids, or are little more than aggressive laxatives! 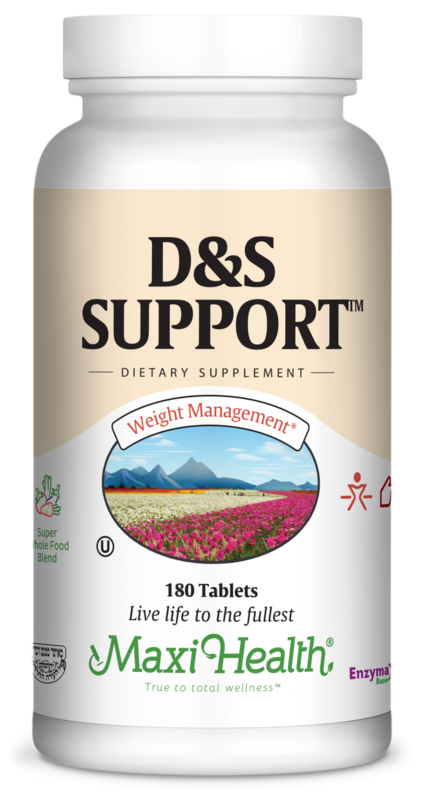 Try D&S Support™ for safe, natural, and successful weight loss aid. Take three (3) tablets with a full glass of water, up to three times daily. For best results take with Maxi Thin Supreme™. Microcrystalline cellulose, dicalcium phosphate, vegetable stearine, modified cellulose gum, Enzymax® (calcium carbonate, bromelain, papain, lipase, amylase, protease, silica), aqueous film coating (purified water, hydroxypropyl methylcellulose, vegetable glycerin). This product contains no animal products, soy, wheat, salt, milk, yeast, gluten, artificial flavors, colorings, or preservatives. Chromemate®, a patented, biologically active oxygen-coordinated niacin-bound chromium complex, is a registered trademark of InterHealth Nutritionals Inc. • Enzymax®, a vital digestive enzyme complex, is a registered trademark of Maxi Health Research® LLC. • Earthrise® is a registered trademark of Earthrise Nutritionals, Inc.